Here are my answers to some common subscriber questions. To ask me a question, send an email to roy@cabot.net. 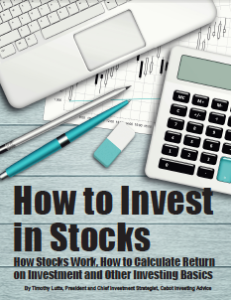 Where can I find the very best stocks to buy? The best low-risk value stocks are included in the Cabot Value Model and the best moderate-risk value stocks are in the Cabot Enterprising Model. The Cabot Value Model is usually sent to you on the first Thursday of each month unless holidays necessitate a change. The Cabot Enterprising Model is usually sent on the second Thursday of each month. Why do you recommend holding so many stocks? I advise owning a large number of stocks primarily to lower your risk. If I could pick 1 to 5 stocks that would consistently outperform most other stocks, I would go along with that method. But there are too many variables in the stock market and too many things that can go wrong. You never know when you are going to get blindsided. Therefore owning a larger number of stocks will reduce the risk of having one stock bring down your portfolio. My rule of thumb is to own about 12 stocks in a portfolio with $100k invested and about 30 to 40 stocks in a portfolio with $1 million or more invested. A lot depends on how many stocks you can comfortably follow, and the amount of risk you can tolerate. The upside to owning a smaller number of stocks is that you can achieve amazing results if you pick mostly big winners. What is the difference between a value stock, an undervalued stock, and a relatively undervalued stock? Any stock can be undervalued. It can be stock of a company that is underperforming and is valued at a low valuation by investors, or it can be stock of a rapidly growing company that is valued incorrectly by investors. The former is generally deemed to be a “value stock,” and the latter is usually considered to be an undervalued growth stock. 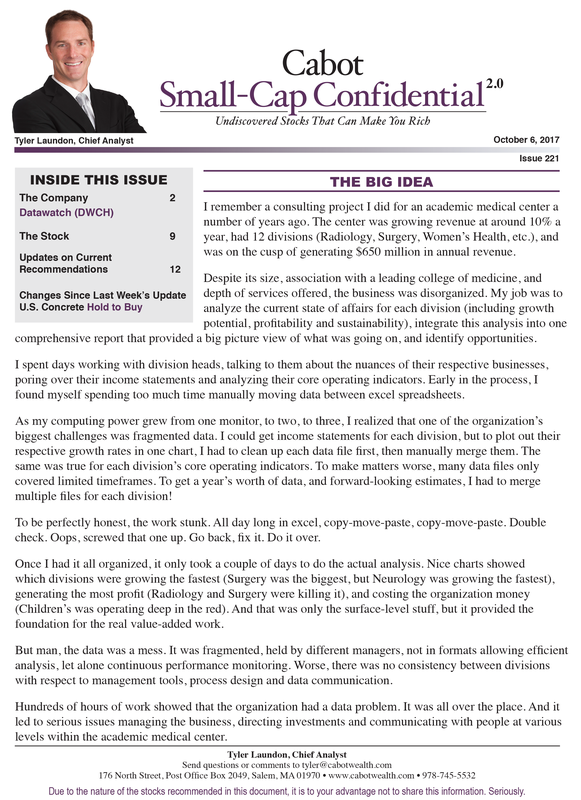 What is the difference between the Cabot Value Model and the Cabot Enterprising Model? 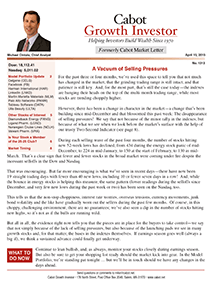 The Cabot Value Model is included in the Cabot Benjamin Graham Value Investor issue sent out usually on the first Thursday of each month. 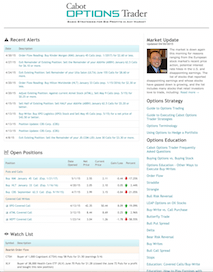 The Model contains a list of 16 value stocks which are rated conservative investments. My Risk Ratings for the stocks are Very Low or Low Risk, and the companies typically pay dividends. 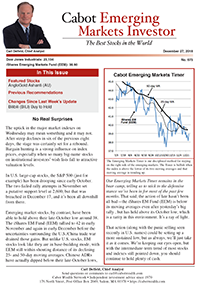 The Cabot Enterprising Model (formerly called Special Features Model) can be found in the Cabot Benjamin Graham Value Investor issue sent out usually on the second Thursday of each month. The Model contains a list of 16 undervalued growth stocks which are rated moderate-risk investments. My Risk Ratings for these stocks are normally Low or Moderate Risk, and the companies’ growth expectations are commensurate with the higher risk profiles. What are NCAV or Net-Net stocks? Benjamin Graham created a formula 80 years ago to find what he called “bargain issues.” NCAV is short for Net Current Asset Value and is calculated by subtracting Total Debt from Current Assets and dividing the result by the number of shares outstanding. This is the NCAV, which is divided into the current price of the stock to determine the Price-to-NCAV Ratio. Comparing the current price to the Price-to-NCAV Ratio will reveal whether a stock is a bargain. Stocks selling at less than the Price-to-NCAV Ratio are considered bargains, and stocks selling below a ratio of 0.67 were considered by Ben Graham to be bargain issues with a margin of safety. During the past several months, I expanded my 1,000 stock database to 7,000 stocks so that I could identify stocks that might qualify as bargain issues containing a margin of safety. The companies which qualified were either small Chinese companies with dubious accounting procedures or very small U.S. or foreign companies with extremely volatile sales and earnings results. Upon further inspection of the stocks in my database, I determined that high-quality companies with Price-to-NCAV Ratios less than 3.00 were also bargains. These companies can produce exceptional stock price performance within one to two years, my usual holding period for the stocks I select. 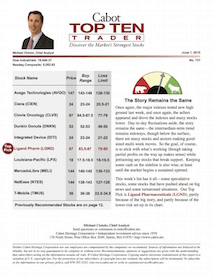 Avnet (AVT) was my first NCAV choice, which I included in the August 2014 Special Features Model. AVT has a Price-to-NCAV Ratio of 2.32. 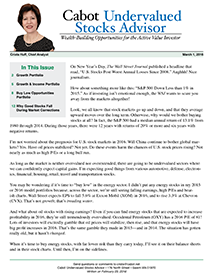 You can read more about the Price to NCAV Ratio and Avnet in the August 2014 Special Feature Edition. How can I possibly invest in all of your buy recommendations? I advise investing in 12 to 30 stocks depending on the size of your portfolio and the amount of time you have available to follow your investments. You will need to pass up many of my new buy recommendations in order to keep your number of stocks at a manageable level. Invest in new stocks when you have funds available from selling a stock or from new contributions to your account. Why aren’t some stocks in the Top 275, which seem to have more attractive numbers, included in the Models? The data presented in the Top 275 Value Stocks provide insight on which stocks deserve further review—the data is not sufficient for a buy or sell decision. Additional research is required for you to make a prudent decision. When I recommend a stock for the Cabot Value Model or Cabot Enterprising Model (formerly called Special Features Model), the stock will remain in the Model as long as its price is reasonable and the outlook for the company is healthy. A stock will no longer be included in a Model when its price rises 5% to 10% above its Max Buy Price or the company’s outlook becomes less healthy. I will then change my opinion from Buy to Hold and “transition” the stock from the Model to the Hold and Sell Recommendations section. When my opinion changes to Hold, I strongly recommend holding the stock. Should I use stop-loss orders? I do not recommend using stop-loss orders when investing in value stocks. If a stock declines, it becomes a better bargain, not a sell candidate. I follow all of my recommendations closely, and when management fails to meet expectations, I will send out a Sell Alert to avoid substantial losses. When you calculate EPS/Price yield are you using trailing earnings and is the AAA bond yield a 30-year maturity? The EPS/Price yield ratio is based on our forward 12-month EPS estimates. The bond yield is the month-end yield for the 10-year Treasury. Is “Net Current Asset Value” a calculation of free cash flow or a proprietary calculation? Net Current Asset Value (NCAV) is calculated by taking the current assets less long-term and short-term debt less the dollar value of preferred stock outstanding. The result is divided by the number of common shares outstanding to get the Net Current Asset Value per share. Most stocks have a negative NCAV, but there are always a few exceptions. When the NCAV divided by the current stock price is less than 1.00, the stock is extremely undervalued. There is usually a reason for the low ratio, but once in a while a “can’t miss” situation arises. Does every recommendation qualify using the 10 criteria found in the Modern Value listings? No, analyses use different sets of criteria to find buy candidates. For example, the Classic Value analysis is based upon Mr. Graham’s seven criteria for value and includes P/E less than 9.0, P/BV less than 1.20, current ratio more than 1.50, etc., while the Modern Value analysis is based upon steady earnings growth and low current price to sales, cash flow, earnings, dividends, and book value ratios compared to the 10-year historical ratios for each company. The Modern Value analysis is based upon a system that Benjamin Graham and my college professor, Dr. Wilson Payne, created in 1946. Do your recommendations in the Cabot Benjamin Graham Value Investor use technical data? 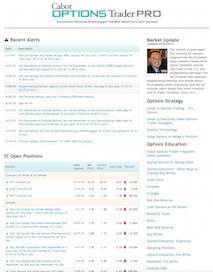 The Modern Value recommendations are partially based upon technical price data. The Total Ratings are derived from the Quality, Value, Growth and Technical Ratings on the Top 275 Value Stocks spreadsheet. 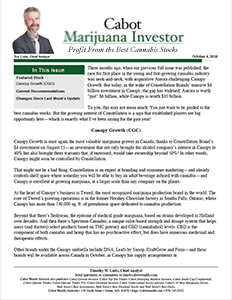 The Technical Ratings are based upon the stock price trends of each stock during the past six months. I have clients who enjoy your system as it follows their personal philosophy. My question are how many stocks should a portfolio hold based on your suggestions? I like to stay quite diversified to spread risk. 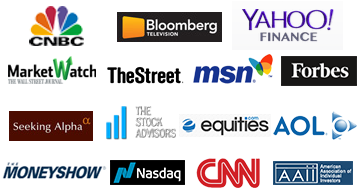 I advise a minimum of 12 stocks for small portfolios and up to 30 stocks for portfolios over $1 million. I recommend choosing stocks from the Cabot Value Model and the Cabot Enterprising Model (formerly called Special Features Model) using whatever criteria is appropriate for you. If you are conservative, I suggest buying more Cabot Value Model stocks, whereas if you are more aggressive, more Cabot Enterprising Model stocks might be more appropriate. 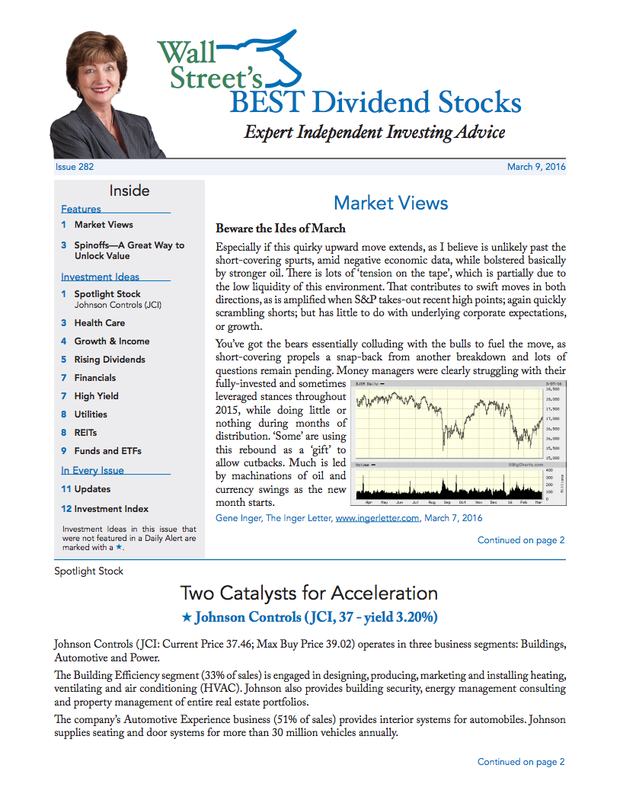 In any case, I recommend buying stocks in as many sectors as is practical. I recommend buying equal dollar amounts of each stock. Unless you majored in finance or are a stock broker yourself, you may not feel confident enough to invest on your own. 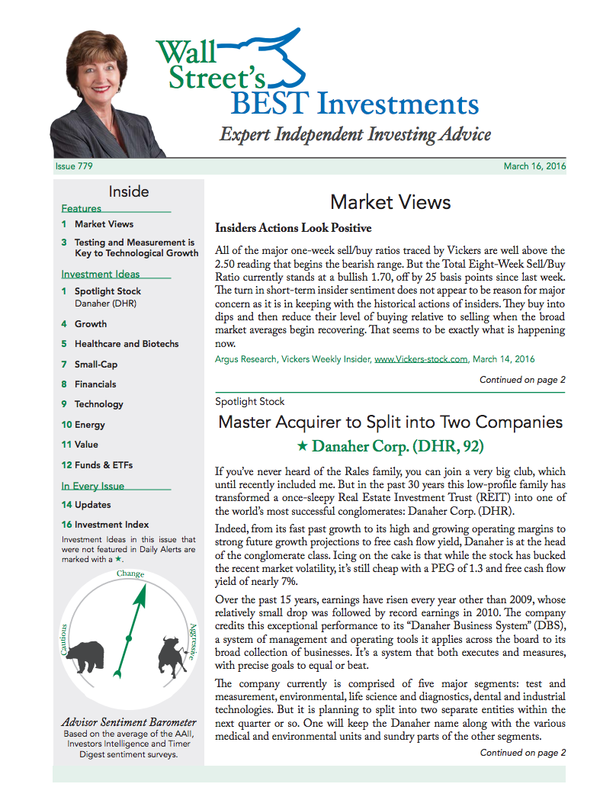 This free report aims to give you the confidence to dive right into the stock market. 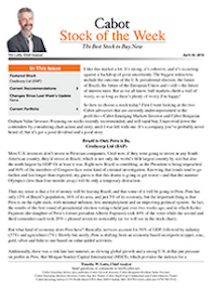 Download it today, FREE when you sign up for our complimentary Cabot Wealth Daily advisory! bargain stocks, ben graham, benjamin graham, best stocks, best stocks to buy, bond, buying stocks, cabot, cabot benjamin graham value investor, cabot.net, choosing stocks, current asset value, dividends, earnings, graham value, growth stock, growth stocks, invest, invested, investing, investing in, investing in value stocks, investments, investor, investors, LOW, margin of safety, ncav, net current asset, net current asset value, net current asset value per share, net net stocks, new stocks, pay dividends, preferred stock, share, shares, stock, stock investing, stock market, stock price, stocks, stocks to buy, the stock market, Treasury, undervalued, undervalued growth stock, undervalued growth stocks, undervalued stock, valuation, value investor, value of preferred stock, value stock, value stock investing, value stocks, yield. 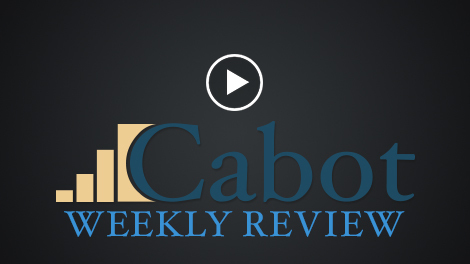 "Over the last few years, Cabot's China & Emerging Markets Report has racked up one of the most remarkable records ever recorded by the Hulbert Financial Digest." It’s fair to say the broad buying pressures have eased up, though to this point, the sellers haven’t done much damage at all. 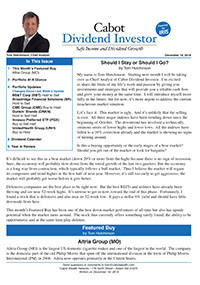 We’re going along with the back-and-forth action, nudging our Market Monitor down a notch—we remain overall bullish, but the current earnings season will have a lot to say about the intermediate-term outlook for the market and leading stocks.